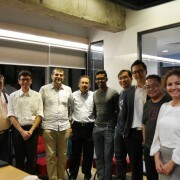 START Friday was back for 2016 with our very first one for 2016 with Mohammad Hazani bin Hassan, Director of Technology Ventures Division, Malaysian Technology Development Corporation, MTDC. Mr. Hazani has 20 years of experience locally and internationally in fund management, venture capital and technology transfer sits on the Malaysian Venture Capital Association (MVCA) and Technopreneur Association of Malaysia (TeAM) management committee and Board of Directors of MTDC’s investee companies. Despite the thunderstorm and bad traffic, we managed to gather an enthusiastic group of entrepreneurs and enthusiast for our event. Below is a brief take home message from the dialogue with Mr. Hazani. CRDF1 – grant specifically for the commercialisation of R&D from public and private universities, government research institutes by a “spin-off companies” from public and private universities. CRDF2 – grant specifically for the commercialisation of R&D from public and private universities, government research institutes by a start-up company. CRDF3(b) – grant for the commercialisation of a public sector R&D by a non-SME. The Technology Acquiring Fund, TAF is to help local companies acquire foreign technology. This historically been focused on manufacturing activities but MTDC is open to other areas as well. Funding opportunity is up to MYR 4 million per grant. The Business start-up Fund, BSF help new start-up technology-based companies. This is a loan in the form of a Convertible Note. The conversion will be into Preferred shares and the price shall be negotiated at the time of conversion. The loan has a three year interest and payment free period. Some of the focus industries of BSF include Industrial Technology, Biotechnology, Sea to Space, Science & Technology Core, and Information Communications &Technology. Funding opportunity is up to MYR 5 million per grant. The Business Growth Fund, BGF is established to support and provide follow up funding to successful grant recipient companies, usually those who had been granted BSF before. This is also in the form of CN with the price agreed upon at the beginning of the loan periodFunding opportunity is up to MYR 10 million per application. The Business Expansion Fun, BEF was established to assist Bumiputera technology based businesses to expand their reach locally and internationally. Funding opportunity is up to MYR 10 million. The company needs to have a minimum of RM 10 million in revenue and be profitable. For more information on the funding opportunities, application process and FAQs, visit http://www.mtdc.com.my/. What does MTDC look for in applicants? All applicant will undergo an aptitude test and background check. MTDC will cross reference with relevant government agencies as well as other funding agencies. Some of the key factors in the funding decision process is the innovative value of the technology, impact on the economy, market opportunities and conditions, and the team. With the conclusion of the event and a special pizza treat for all those who attended, we have kicked off 2016 with a bang and we promise to bring more speakers for you. Do you have a particular topic in mind that you would like to know more about? Let us know by heading over to this link: http://goo.gl/forms/9hKQ2zEQRF and stay tuned for more START Fridays and events from START Co-Working Space.